January 7, 2016 - There can be many challenges for the airlines when an aircraft is flown at a great distance from it home base, one of such change can be dealing with an aircraft maintenance issue. This happened to be the case for Australian air carrier Qantas Airlines when one of its Boeing 747-400s needed an engine replacement after landing in Johannesburg, South Africa. Qantas Airlines had several options available to deal with replacing the engine. The carrier could ferry the aircraft back to Australia. However, the Boeing 747 range on 3 engines is poor and the takeoff distance needed is as well not ideal at many airports. The company could have had the engine shipped to Johannesburg but this would have been very expensive and time consuming. The company instead opt to attached a fifth engine to one of its 747's and fly it to Johannesburg. The Being 747 has a unique capability in which it has spare engine attachment brackets located under the wing closes to the aircraft fuselage which allows to attach a fifth engine in order to handle such a maintenance issue. Years ago this was a practice used by the airlines. 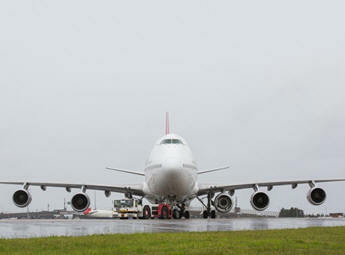 On Wednesday, a Qantas Airlines Boeing 747, Flight QF63 departed from Sydney for Johannesburg with a fifth Rolls Royce 747 engine fitted and attached to the aircrafts inner left wing. Added fuel was placed in the right wing to compensate for the fifth engine which weighed over 12,000 pounds (6 tons). This fifth engine added extra weight to the aircraft and also increases drag. The fifth engine was not powered up for the flight. Qantas Airlines reported Flight QF63 had to make an extra fuel stop in Perth before continuing its flight. The engine that is to be removed will be shipped by boat and sent back to Sydney for an overhaul.